Dog is man’s best friend, as the saying goes. But it does not hold good all the time, especially when one has too many dogs around. What one gets then would be a sense of fear, and often it is not unfounded. Madurai roads give the best example of such a situation. The health wing of the Madurai Corporation prepared a report on June 28, which states that there are 34,325 stray dogs in the city, and their concentration is more in thickly populated localities. “Rabies is one of the oldest diseases…it is 100 per cent preventable, but at the same it will be highly fatal if one acquires rabies and delays getting treatment. Dog bite requires complete course of treatment,” says R.Balajinathan, Professor of Medicine and Nodal Officer for Rabies Control, Government Rajaji Hospital here. Complaints of stray dog menace are more from Vilangudi, Viswanathapuram, Tirunagar, Avaniapuram, Vandiyur, Valar Nagar, Uthangudi, Thiruppalai, Iyer Bungalow and Tirupparankundram. Dog catchers, Corporation officials and doctors allege that “blackmail” by Blue Cross has been a hindrance in controlling stray dogs. “Safe practices and norms are followed in animal birth control (ABC) activity at Sellur centre. Yet, our dog catching team is afraid because Blue Cross people take video,” S.Murugan, Sanitary Inspector and ABC Centre in-charge, Madurai Corporation, points out. While the civic body is focusing on sterilisation and rabies vaccination for dogs, the GRH has become an important centre in southern districts to treat dog bite cases. According to Dr.Balajinathan, the rabies unit at the GRH receives 60 new cases (adults) and 40 cases of children who were bitten by street dogs every day. “This number indicates the intensity of the problem. If a person is bitten by a dog, there should not be time lapse. The people should remember that there is no treatment for rabies, but there is an effective treatment to prevent rabies. Dog bite cases have to be attended quickly,” he cautions. Every year, 15 persons are dying due to rabies in the GRH alone and the threat can be well understood if statistics from other hospitals are taken into account. Hydrophobia, the fear of water, is the clinical sign to diagnose whether a person is having rabies. 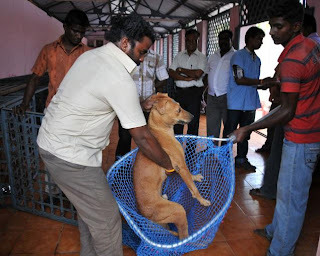 In June, 445 dogs were sterilised at ABC centre in Sellur with an objective of reducing the population and Rs.1,98,025 was spent for the purpose. Rabies vaccine too will be administered for stray dogs. “Catching dogs is not an easy task. Our workers run behind dogs to hold them and lift them onto our vehicle. We have requested the Corporation Commissioner to provide more dog catching vehicles,” Mr.Murugan said. There was a proposal to start one more sterilisation centre at Avaniapuram. An expert team from Ooty visited Madurai recently to train Corporation staff in the latest safety practices to be followed while dealing with stray dogs, he noted. “Don’t think that my dog is good and it will not carry any infection. There is no guarantee on that despite immunisation and vaccination,” Dr.Balajinathan says. Canine experts say that any contact with dog’s saliva is dangerous and more so in the case of street dogs since they may not have been given rabies vaccine. They point out that animal birth control through sterilisation by the Corporation can only reduce the population but the inherent risk of rabies continues among the existing dogs. A 48-year-old woman from a village near Alanganallur suffered a dog bite, but her family did not bother much. After six months, suddenly, she started behaving strangely and doctors thought she was a psychiatric patient. “She was diagnosed as a rabies patient and within one day of getting admitted to hospital she died,” a doctor said. The first thing to be done in case of a dog bite is that the place where it was bitten should be washed with a detergent soap in running water for 10 minutes. It is said to be an important first-aid. The detergent soap has sodium hydroxide which has the power to dissolve the rabies virus, if any, substantially. As thousands of dogs on Madurai roads are threatening the people, it is expected that the Corporation and Blue Cross will find a way out to put the barking stray dogs at bay. Those who want to complain about street dogs in their areas can contact Corporation Sanitary Inspector Murugesan on mobile number 97888-10136.